Ju 87 deliveries to Luftwaffe squadrons began in the spring of 1937. Late that year Ju 87s began to arrive in Spain to support the Nationalist forces in the Spanish Civil War. Despite relatively poor performance, the Ju 87 was effective against both ground targets and shipping. The Ju 87 saw combat on every front on which the Germans fought during the war. Designed to serve as "long-range artillery" to support the German Army, the Ju 87's bombing accuracy was less than 30 yards. However, the aircraft's effectiveness presupposed control of the air and when that could not be guaranteed by German fighters, the slow, lightly armed Ju 87 was extremely vulnerable to interception. In May 1940 the assault on Holland and France, the Ju 87 devastated the city of Rotterdam. The plane was employed in the Battle of Britain beginning in July 1940, with some 280 Ju 87's available for strikes on Britain. But the Stuka was withdrawn on Aug. 19 following heavy losses from RAF fighters. (For example, on Aug. 17 of the eighty-five Ju 87's attacking targets in Britain, twenty-six were shot down and another fourteen were damaged). Subsequently, the aircraft was flown extensively in the Mediterranean and on the Eastern Front, again with great success. Flying in the anti-shipping role, the Ju 87 was able to heavily damage two British aircraft carriers in the Mediterranean, and to sink and damage many other ships. (The only dive bombers to surpass the Ju 87's effectiveness in attacking warships were the U.S. SBD Dauntless and the Japanese Val.) Late in the European War the Allied control of the air over Germany forced the employment of the Ju 87 as a night bomber. The Ju 87 was the product of the Junkers firm, pushed into service by Generaloberst Ernst Udet, who in 1931 had observed the dive-bombing technique being developed by the U.S. Navy. Encouraged by Hermann Goring, the Reich minister for aviation, Udet demonstrated dive bombing in Germany. By the end of 1935 the Junkers firm had produced the prototype Ju 87, which was flight tested late that same year. After its combat introduction in Spain, Goring ordered production accelerated and through 1944 more than 5,000 aircraft were produced. Italy, Rumania, Hungary, and Bulgaria also flew the Ju 87 during the war. The single-engine plane had inverted gull-shaped wings, an in-line, water cooled engine, and large, fixed landing gear with "spats" covers. Bombers were carried under the wings and fuselage, and the cockpit held a pilot and radio operator, the latter firing a machine gun to protect the rear of the place when in a dive. In production aircraft an autopilot was fitted to take control if the pilot blacked out during a dive. The Germans found that when dive bombers pushed over into their dive they had a terrifying effect on troops; Ernst Udet conceived the idea of increasing the natural howling of the dive by attaching sirens to the undercarriage. The place was considered easy to fly and very popular with its pilots and troops they supported. 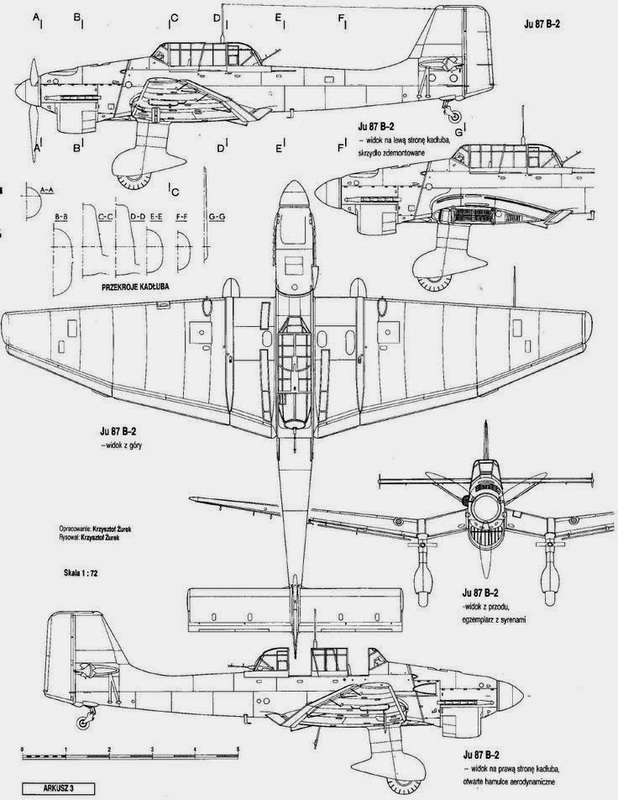 The Ju 87C variant had upward-folding, outer wing panels, a tail hook, and other features for use from the never-finished aircraft carrier Graf Zeppelin. 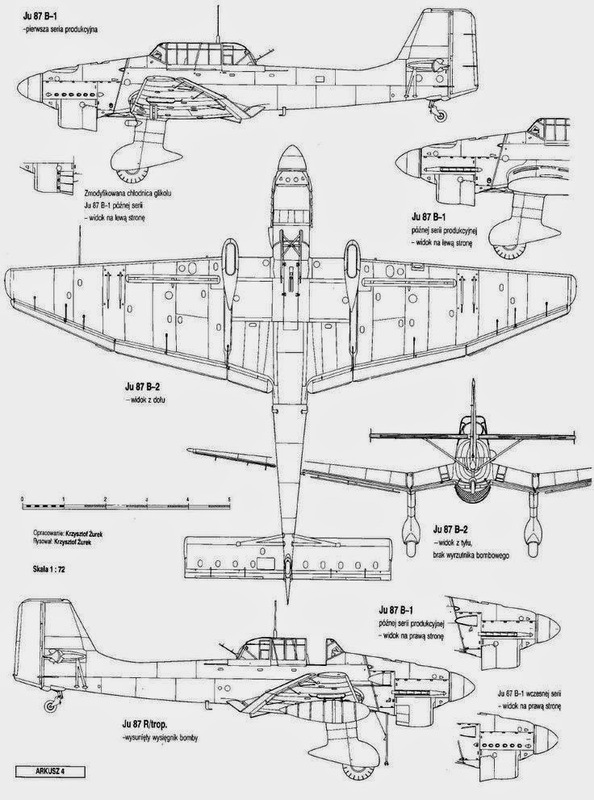 The Ju 87D-3 was experimentally fitted with twin pods on its wing, each for carrying two agents who were to be dropped behind enemy lines; despite extensive tests, this scheme was not adopted. Maximum speed of the Ju 87D model was 255 mph; cruising speed was 198 mph. Range with a 3,960 pound bomb load was 620 miles; with maximum fuel and a token bomb load the aircraft could fly almost double that distance. A higher performance variant, the Ju 187 with a remote-controlled gun turret and retracting undercarriage was under development when the war ended. The two-seat Ju 87 had two fixed, forward firing 7.9 mm machine guns and a twin 7.9 mm machine gun on a flexible mount in the rear cockpit. 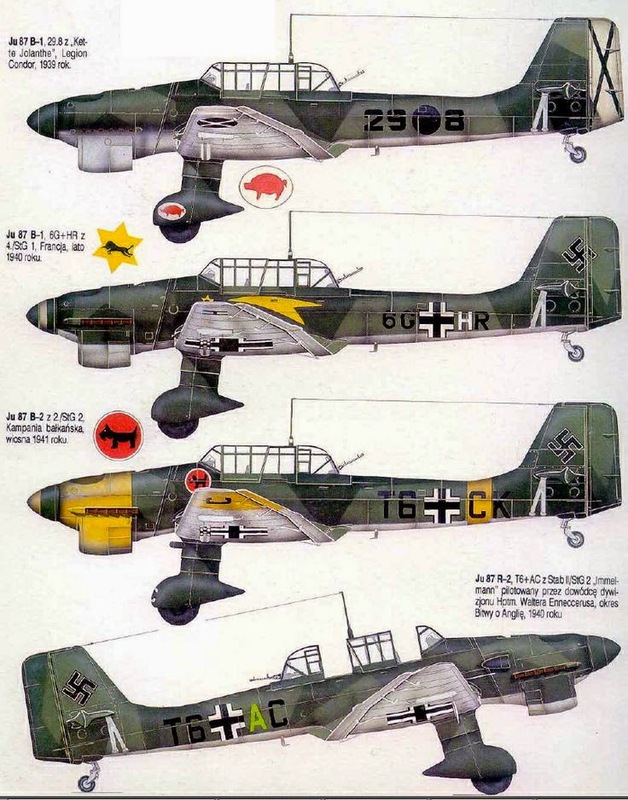 For short-range missions the Ju 87 could carry one 3,970 pound bomb or a variety of lesser weapons or two under-wing pods with multiple machine guns or paired 20 mm cannon. Bombs: Normal load = 1× 250 kg (551 lb) bomb beneath the fuselage and 2× 50 kg (110 lb) bombs underneath each wing.